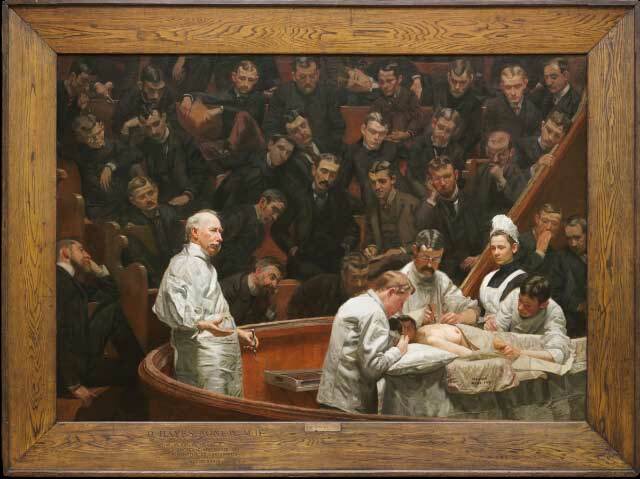 Thomas Eakins‘ celebrated “The Gross Clinic,” purchased jointly for $68 million in 2007 by the Philadelphia Museum of Art and the Pennsylvania Academy of the Fine Arts, is being returned to public view on Saturday as part of a larger exhibition, after a startlingly transformative restoration overseen by Mark Tucker, the museum’s vice chair of conservation and senior conservator of paintings. The overall tonality of the painting is now considerably less dramatic and more subdued, “as Eakins intended it to be,” according to the Philadelphia Museum’s press release. What I’m wondering is how the entire cast of the painting has changed so dramatically, through a restoration that the museum insists was accomplished strictly by filling in losses. It does appear (from comments made to the Philadelphia Inquirer, below) that the conservators painted over Eakins’ underpainting, from which the top layers had been scrubbed away by overzealous restorers in the 1920s. 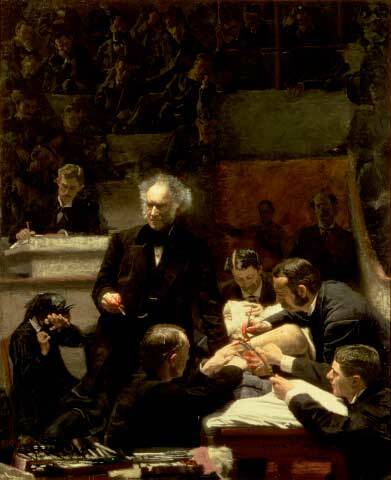 paint Eakins had used to perfect the relationships of tones. preferring it to Eakins’s deep tone, inappropriately uncovered it. Eakins’s own work will also be clearest. The museum’s officials discussed the outcome of that “ongoing discussion” with Stephan Salisbury of the Philadelphia Inquirer, for his recent article on the restoration. starts to come together again,” Tucker [the conservator] said. damages,” interjected [Kathleen] Foster [senior curator of American art]. conservation say you can’t change the known character of the original. original paint surface. This is an underpainting…. There’s more by Salisbury about the restoration, here. Gross Clinic” and “The Agnew Clinic”—will finally be exhibited side-by-side. the first time that they’ve been seen together in the same room.